This spring's Charlotte-Mecklenburg Senior Games will include tennis! Registration is currently open, through April 1, for Senior Games. Tennis events, including men's and women's singles and doubles, and mixed doubles, will be held the week of May 11th from 5:00-8:00 PM at the Freedom Park tennis courts. Specific times will be announced the first week of April once registration is completed. The entry fee is $10.00. This is a flat fee that allows you to participate in other non-tennis events for one low charge. 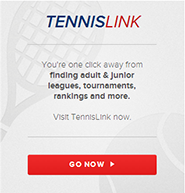 You pay just $10.00 plus $3.00 for each tennis event entered. Senior Games is open to anyone 55 and better. Registration forms can be found at local recreation centers or click here to access and print the 2009 Entry Packet. This packet includes information on all the Senior Games events, fees, eligibility requirements, entry form, and game rules.